You save 46% off RRP! Portrait oak frame: Usher (There are other designs available:traditional usher, best man and groomsman). houses a 6 x 4 inch photo. Every frame unique with the effect of laser engraving on the grain of the wood. Substantial weight - approx 470 grams. Measures approx 18cm x 23cm x 2cm. 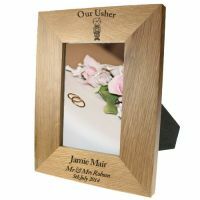 Personalisation Guidelines: Recipient's Name (First & Last Names only- no middle names), Title and surname of couple i.e Mr and Mrs Brown ('Mr & Mrs' will be the default option engraved if no information is provided) and wedding date.